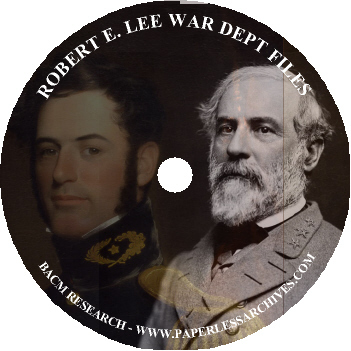 3,410 pages of War Department files and Department of Defense documents pertaining to General Robert E. Lee. 650 pages of selected War Department files. 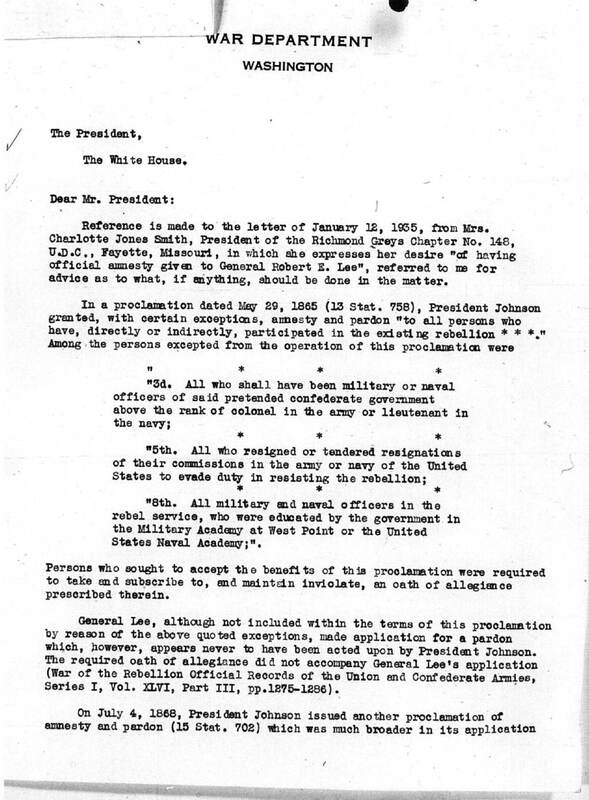 The material includes letters received by the Adjutant General's Office. These begin with Lee's application to West Point in 1824 and conclude with his resignation in 1861. They also include Lee's compiled military service record, 1861-65. 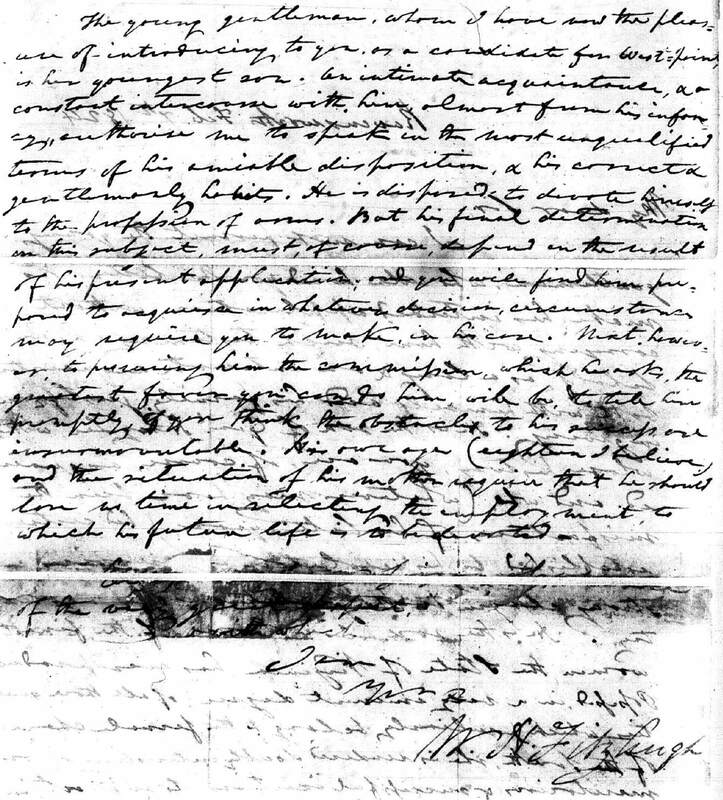 General Robert E. Lee's Letters to Lt. Gen. Ulysses S. Grant regarding the terms of surrender, April 7-9, 1865. The parole of honor signed by Gen. Lee and members of his staff, April 9, 1865. 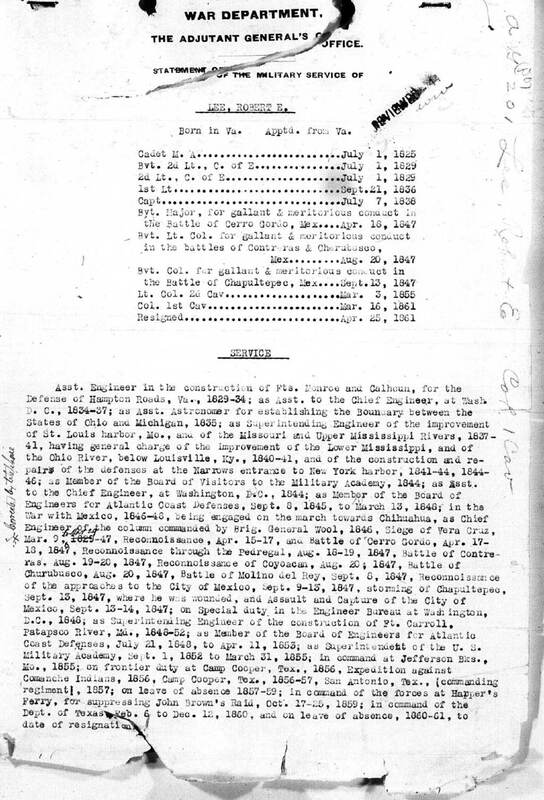 The 201 File for Robert E. Lee, Old Records Division, Adjutant General's Office. Lee's 201 file includes material dating up to 1948. Includes documents concerning Special Order 191. General Lee following his tactical success in the Second Bull Run, August 28�30, 1862 (Battle of Second Manassas), led his Army of Northern Virginia into western Maryland to secure supplies, and in the hope of winning its people to the Confederate cause. Under Special Order No. 191 Lee divided his army during the Maryland Campaign, creating a vulnerability that Union general George McClellan discovered after a lost copy of Lee's orders had been found by a Union private. Despite boasting of the trap he would set, McClellan moved too cautiously to make full use of the intelligence, giving Lee time to reunite his forces. What could have been a decisive Union victory instead left the Union simply holding the field at Antietam after the costliest single day of combat during the Civil War. This collection includes the copy of the lost order. 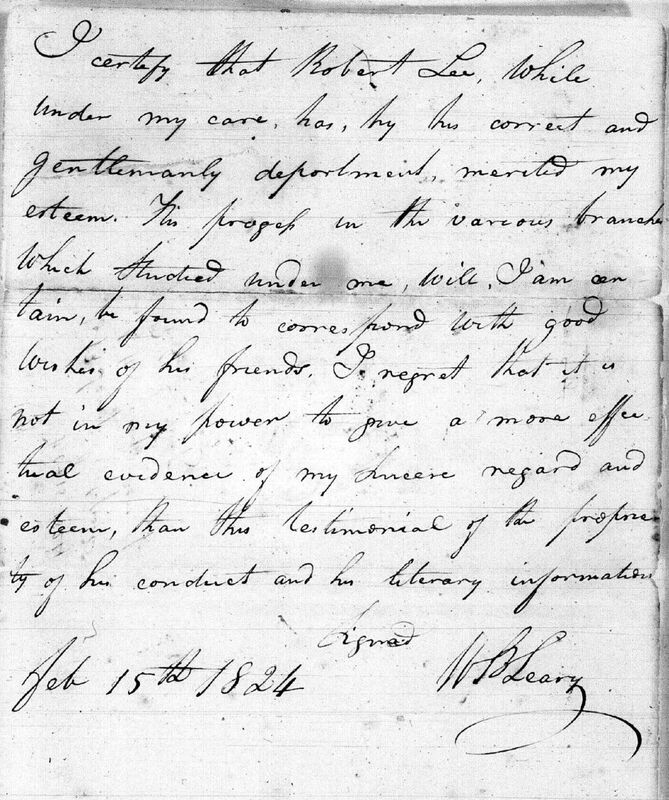 Also included is another copy of the order which was not lost, which was hand copied by General Thomas "Stonewall" Jackson, and sent to General D. H. Hill. This collection includes the ledger copy of a telegram from Major General George McClellan to General Major Henry W. Halleck Regarding General Robert E. Lee's Special Order No. 191. This collection includes documents from the Confiscation Case File of Robert E. Lee involving the seizure of Robert E Lee's Arlington home, and Lee's personal property at Arlington House. The record groups these files are drawn from at the National Archives and Records Administration include the records that are part of the Records of the Adjutant General's Office, 1780's-1917, Record Group (RG) 94; Records of the Office of the Chief of Engineers, RG 77; War Department Collection of Confederate Records, RG 109; and Records of the Adjutant General's Office, 1917-, RG 407. Text of General Robert E. Lee's dispatches to Confederate President Jefferson Davis transcribed in the book, "Lee's Dispatches: Unpublished Letters General Robert E. Lee, C.S.A. to Jefferson Davis and the War Department of The Confederate States of America 1862-1865. From the Private Collection of Wymberley Jones De Renne of Wormsloe, Georgia." This 482 page book contains transcriptions of 204 dispatches from Robert E. Lee. In 1911, writer Douglas Freeman came into possession of a cache of long-lost wartime communications between Robert E. Lee and Confederate president Jefferson Davis. Freeman spent four years working on the documents, and in 1915 published "Lee's Dispatches." The book was received enthusiastically by Civil War historians, and became an important primary source for Civil War scholars. Written between June 2, 1862 and April 1, 1865, Lee's letters to Davis revealed the general's strategy with clearer perspective, give a view of some of Lee's decisions, and underscored his relationship with Davis. In his introduction Freeman summarized seven major revelations contained in the letters. For example, the letters reveal that the Confederate high command in 1862 considered but rejected a bold proposal to strengthen Stonewall Jackson's army in the Shenandoah Valley and embark on a vigorous offensive campaign against the North, even at the expense of defending Richmond. 1,090 pages of Civil War staff ride guides/handbooks covering key battles involving Robert E. Lee. A staff ride is a military educational technique used in professional military education and training. Staff rides were developed by the Prussian general Helmuth von Moltke the Elder early in the nineteenth century. In 1906, Major Eben Swift took twelve officer-students from Fort Leavenworth's General Service and Staff School on the Army's first staff ride to the Chickamauga Battlefield. Since then staff rides have been used to varying degrees in the education of Army officers to narrow the gap between peacetime training and war. The Staff Ride was revived at the Command and General Staff College in the early 1980s. Staff rides involve field study at the actual site of battle. Onsite battle command decisions and their possible alternatives are examined. The students are active participations, often groups of student assumes the role of a participant in the battle, and are questioned about occurrences of the battle, decisions taken and whether alternatives could have been employed. A 1,090 page collection of monographs authored my U.S. service member historians. These theses were completed and accepted by U.S. Army Command and General Staff College Thesis Committee between 1991 and 2008. They were written by service members with the rank of Major seeking a Master Degree of Military Art and Science from the U.S. Army Command and General Staff College at Fort Leavenworth, Kansas a graduate school for United States Army. Abstract: Robert E. Lee, in his first campaign as the new commander of the Army of Northern Virginia, stopped the Union offensive against Richmond in a series of engagements known as the Seven Days. Although eventually successful, Confederate operations were clumsy and erratic and often missed opportunities to secure greater success. At the end of the Seven Days Lee reorganized his forces and began preparations for his next campaign. This new campaign, which resulted in the Battle of Second Manassas just two months later, is widely considered to be one of Lee's most brilliant operations. The purpose of this monograph is to identify the changes and improvements that occurred within Lee's army which enabled it to show this vast improvement in such a short time span. The monograph uses LTC James Dubik's model for campaign analysis which is a modification of the familiar "ends, ways, and means" characterization of campaign planning. It evaluates four components of a campaign: intellectual, cybernetic, psychological-physical, and harmonic as a methodology for comparative analysis. Despite his inexperience, Lee was able to learn from his first campaign. He could recognize what needed to be done and had the ability to do it. Each of the adjustments and modifications he made were important but not decisive by themselves. It was the synergism of changes combined with improved operational planning which proved to be the secret in transforming Lee's troops into the legendary Army of Northern Virginia. Critical Analysis of Lee's Defense at Fredericksburg - 1862: A Tactical Victory or an Opportunity for Operational Success Lost. Abstract: This paper examines one aspect of warfare at the operational level, the defense, and attempts to identify how the elements of planning, preparation, and execution, previously applied in the conduct of the tactically-oriented Active Defense, must be modified with the adoption of our operationally-oriented Air-Land Battle doctrine. Abstract: This study investigates the concept of loyalty as applied in the U.S. Army. In light of the fact that the term has been dropped from the official definition of the Army Ethos in the 1994 version of FM 100-1, the study investigates the implications from a historical perspective. The American Civil War is used as the only appropriate conflict where issues of loyalty were widespread in the existing U.S. Army. This study is an analysis of the competing initiative displayed between Generals Ulysses S. Grant and Robert E. Lee during Grant's 1864 Overland Campaign in Virginia. It begins with Lincoln's appointing Grant as Lieutenant General and General in Chief of all Union armies on March 9, 1864, and concludes with the failure of Grant's June 18 assault at Petersburg, Virginia. Grant and Lee's campaign intentions are analyzed, their means are compared, and their armies' actions are described and analyzed to determine that Lee displayed greater initiative than Grant. Lee demonstrated superior initiative during the campaign because he forced Grant to deviate from his plans and attack formidable defensive positions, and because he held the final initiative. Each of Grant's flanking movements was an attempt to gain the initiative, followed by the destruction of Lee's army. The Seven Days, June 25- July 1, 1862. Thesis Statement: General Robert E. Lee's tactical plan used in the civil War during the Seven Days' Battle won a quick, decisive victory; likewise, during Desert Storm, General H. Norman Schwarzkopf, using a similar tactical plan for ground operations, proved victorious. Discussion: A comparison of the tactics used by Lee during the Seven Days' Battle revealed many similarities to the ground tactics employed by Schwarzkopf during Desert Storm. The enemy outnumbered both generals approximately 2-to-1; therefore, they could not simply overwhelm their enemy. They had to develop a superior plan to outthink and outmaneuver the enemy, thereby taking the enemy by surprise. Conclusion: Though over 100 years apart, Lee and Schwarzkopf had similar ideas, tactics and battle plans. Though severely outnumbered, both leaders "outthought" the enemy with a daring and cunning plan, proving their tactical genius for ground operations. Both became victorious. Their actions live in history for future leaders of the Army to use for victory on the next battlefield. This thesis compares and contrasts the field artillery corps of the Army of Northern Virginia and the Army of Tennessee. The purpose is to determine which field artillery corps was more effective on the battlefield and why. Opportunities Gained and Lost: J. E. B. Stuart's Cavalry Operations in the Seven Days Campaign. This study evaluates Confederate cavalry operations 12 June to 3 July 1862, as a prelude to and as a part of the "Seven Days Campaign." General Robert E. Lee's Seven Days Campaign succeeded in defeating a Union offensive aimed at Richmond, Virginia and served as an important turning point in the American Civil War. The thesis seeks to determine the substantive contributions General J. E. B. Stuart's cavalry brigade made to this Confederate victory, as well as to assess the strengths and shortcomings of his particular style of mounted employment. Stuart launched an armed reconnaissance 12-15 June 1862 known thereafter as the "Chickahominy Raid" that provided intelligence vital to General Lee's success in the campaign and helped to bolster sagging Confederate morale. This was the first of the Confederate cavalry leader's renowned raids, a style of operation that would be adopted by other Confederate cavalry leader's renowned raids, a style of operation that would be adopted by other Confederate mounted units and the Union cavalry as well. Stuart also attempted to strike out independently during the Seven Days Campaign itself, but his activities in this regard were not well synchronized with the rest of Lee's army. As a result, Stuart missed opportunities to play a more decisive role in the battles outside Richmond. Confederate Strategy in 1863: Was a Strategic Concentration Possible? Abstract: The U.S. Army was oriented on a cordon defense. Jefferson Davis, having learned this during his time as the U.S. Secretary of War, attempted to implement a cordon defense when he became the President of the Confederacy. Other Confederate strategists advocated a Jominian concentration. One of the earliest was P. G. T. Beauregard, who generally suggested a concentration on the Tennessee theater. The Confederacy responded to the crises of 1862 with marginally successful strategic concentrations in Mississippi and Virginia. Throughout the war, Davis countered attempts at form offensive concentrations with suggestions on a defensive concentration to shore up threatened sectors. In the spring of 1863, Robert E. Lee suggested a decisive offensive concentration in Virginia for a campaign in Pennsylvania, which Lee believed could be the decisive campaign of the war. Davis accepted Lee's ideas on the campaign, but did not ensure adequate support for it. Confederacy had forces available before the campaign. The monograph uses five criteria to evaluate concentrations: distance, time, combat power, leadership, and purpose. The monograph uses these criteria to evaluate the Confederate strategic situation in 1863 and draw some conclusions relevant to modern concentrations. Information and Structure - A Case Study: The Battle of Second Manassas. Abstract: This paper explores the impact that an army's structure has on its ability to process information and achieve victory on the battlefield. It discusses the following questions. What is information and how is it related to organizations? How does organization structure facilitate or obstruct the flow of information? How does organizational structure affect the ability of the senior leader to make correct decisions? To explore these issues further, they are considered in the context of the American Civil War Campaign of Second Manassas. The effects of organizational structure on information flow are examined in the context of the American Civil War Battle of Second Manassas. In August 1862, General John Pope's Army of Virginia opposed General Robert E. Lee's Army of Northern Virginia in Western Virginia. During this battle both armies employed a similar hierarchical structure, though they differed with respect to the way their cavalry was organized. In Lee's army the cavalry was centralized under Major General Jeb Stuart who reported directly to Lee. The cavalry in Pope's army was subordinated to three separate corps commanders. Pope did not have direct control over his cavalry. Pope's experience during the Battle of Second Manassas shows organizational structure does affect information flow. Pope failed to receive key information on several occasions and received it many hours late in other instances. Lee had direct control of his cavalry. There was no intermediaries to block information flow. Lee had a correct view of the battle and at the decisive time committed Longstreet's command into the Union flank to win the battle. Abstract: This monograph analyzes the Confederate Maryland campaign of 1862 in regard to several key concepts of military theory. As an operation involving extended effort and multiple battles, the campaign serves as a case study reinforcing the utility of classical military theory in operational planning. The monograph begins by developing a theoretical paradigm for use as a model to analyze the Confederate operations. Next, an historical overview of the strategic situation, campaign plan, and execution reveal the harsh realities of combat. T The monograph concludes that Lee's campaign in Maryland was unsuccessful due to failure at the operational level of war. The Confederate strategy to acquire foreign recognition, liberate Maryland, and influence the upcoming northern Congressional elections was sound. Additionally, the tactics employed by the Army of Northern Virginia were exceptional. Prior to this campaign, the army won a stunning victory at Second Manassas with the aggressive leadership of Lee, Jackson, Longstreet, and Stuart. Yet, in the Maryland operation, Lee's army was almost destroyed at the battle of Antietam, a result of poor operational planning and the intervention of friction and chance. During this operation the South lost more soldiers to straggling than at any other time in the war. The army reached its culmination point due to arduous marching. Decisions to capture Harper's Ferry further eroded the combat power of the army. The campaign to end the war became a desperate fight for survival at Antietam. In that light, the campaign is a clear example of weak operations being saved by tactics. While the tactics saved the army from destruction, strategically the South was forced back to defensive operations in Virginia. The results of this campaign provided President Lincoln the opportunity to issue the Emancipation Proclamation changing the nature of the conflict from a fight over union to a war to free the slaves. Gettysburg Campaign: Birth of the Operational Art? Abstract: While hundreds of volumes exist on the Gettysburg Campaign, most examine the battle's tactical framework and focus on the activities of brigades and regiments. However, of more interest to the serving military professional may be an analysis of the degree to which the Confederacy's design and execution exemplify attributes of what is now known as the operational art. This monograph analyzes the 1862 Peninsula Campaign. Robert E. Lee, ranking general of the armies of the Confederacy during the Civil War, was born January 19, 1807 at Stratford, Westmoreland County, VA, and died October 12, 1870, at Lexington, VA. He was appointed to the United States Military Academy at West Point July 1, 1825, from which he graduated second in his class. Upon graduation, he was brevetted a second lieutenant in the Corps of Engineers, July 1, 1829. He thereafter rose steadily through the ranks, especially as a result of "gallant and meritorious conduct" in battle in the Mexican-American War during 1847. He was promoted to first lieutenant, September 21, 1836; captain, July 7, 1838; brevet major, for gallant and meritorious conduct in the Battle of Cerro Gordo, Mexico, April 18, 1847; brevet lieutenant colonel for gallant and meritorious conduct in the battles of Contreras and Churubusco, Mexico, August 20, 1847; brevet colonel for gallant and meritorious conduct in the battle of Chapultepec, Mexico, September 13, 1847; lieutenant colonel, 2d Cavalry, March 3, 1855; colonel, 1st Cavalry, March 16, 1861. He resigned April 20, 1861. His service in the U.S. Army included the following: assistant engineer in the construction of Forts Monroe and Calhoun, for the defense of Hampton Roads, VA, 1829-34; assistant to the chief engineer at Washington, DC, 1834-37; and assistant astronomer for establishing the boundary between the states of Ohio and Michigan, 1835. He was superintending engineer of improvements to the St. Louis, MO, harbor, and the Missouri and Upper Mississippi Rivers, 1837-41; had general charge of improvements to the Lower Mississippi and the Ohio River below Louisville, KY, 1840-41; and also had general charge of the construction of and repairs to the defenses at the Narrows entrance to New York harbor, 1841-44 and 1844-46. He was a member of the Board of Visitors to the Military Academy, 1844; assistant to the chief engineer at Washington, DC, 1844; and member of the Board of Engineers for Atlantic Coast Defenses, September 8, 1845, to March 13, 1848. During the Mexican-American War, Lee was chief engineer of the column commanded by Brig. Gen. John E. Wool during the march toward Chihuahua, 1846. During 1847, he was involved in the siege of Vera Cruz, March 9-29; reconnaissance, April 15-17; the Battle of Cerro Gordo, April 17-18; reconnaissance through the Pedregal, August 18-19; Battle of Contreras, August 19-20; reconnaissance of Coyoacan, August 20; the battle of Churubusco, August 20; Battle of Molino del Rey, September 8; reconnaissance of the approaches to Mexico City, September 9-13; storming of Chapultepec, September 13, where he was wounded; and the assault and capture of Mexico City, September 13-14. He was on special duty in the Engineer Bureau at Washington, DC, 1848; served as superintending engineer of the construction of Fort Carroll, Patapsco River, MD, 1848-52; was a member of the Board of Engineers for Atlantic Coast Defenses, July 21, 1848, to April 11, 1853; and served as Superintendent of the United States Military Academy, September 1, 1852, to March 31, 1855. He was in command at Jefferson Barracks, MO, 1855; on frontier duty at Camp Cooper, TX, 1856-57; in the expedition against Comanche Indians, 1856; and at San Antonio, TX, 1857. He was on leave of absence from 1857-59. Upon his return to duty, he was in command of the force at Harper's Ferry that suppressed John Brown's raid, October 17-25; in command of the Department of Texas, February 6-December 12, 1860; and on leave of absence thereafter until his resignation. On April 23, 1861, Lee accepted command of the armed forces of Virginia, and on August 31, 1861, became a full general in the Confederate Army. For nearly four years, Robert E. Lee was the dominant figure in the Confederacy's military attempt to use military force to maintain succession from the United States, but on April 9, 1865, at Appomattox Courthouse, VA, he surrendered to Lt. Gen. Ulysses S. Grant. After the war, Lee accepted the presidency of Washington College in Lexington, VA; following his death, the school was renamed Washington and Lee University.